A rendering has been released for a Morris Adjmi-designed apartment building in South Williamsburg, Brooklyn. Curbed reported that the 13-story building contains 82 rentals and 26,000-square-feet of landscaped space; the base of the building has about 30,000-square-feet for retail, and a nearly 7,000-square-foot community space. The under-construction structure is located just steps from the J,M,Z subway lines, and only a few block inland from the Domino Sugar Factory. While Goldstein, Hill & West is the architect of record for 282 South 5th St., it’s clear that Adjmi had a heavy hand in the design. 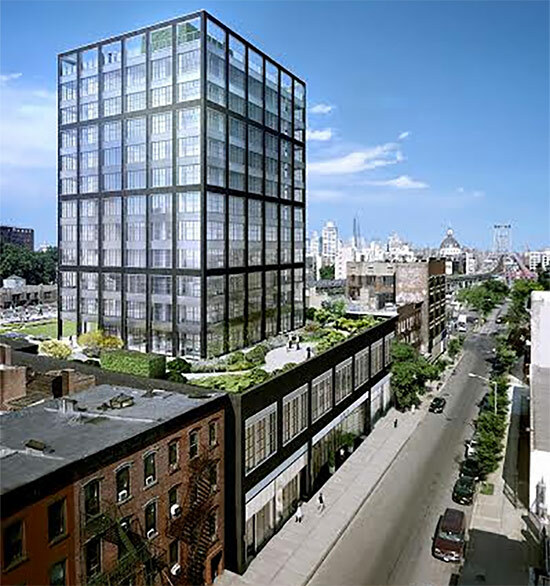 The structure’s glass facade is framed with a black, steel exoskeleton that resembles his work at the Wythe Hotel and a host of other buildings he has designed around the city. It could also be seen as the “before” version of his twisting topper in the Meatpacking District.